Aim: To assess the biocompatibility of an experimental endodontic paste based on the ethyl acetate fraction of Pothomorphe umbellata + calcium hydroxide, using propylene glycol as vehicle, in connective tissue of rats. Materials and Methods: Fifteen rats had four polyethylene tubes implanted in their backs, with each one containing the experimental paste. The tube side was considered the control group. After 7, 21, and 42 days, animals were euthanized. Results: Intense inflammatory reaction was noticed after 7 days for experimental paste and it was moderate for control group. At 21 days, the inflammatory reaction was moderate for experimental paste and discrete for control group; and at 42 days, it was discrete for experimental paste and control group. 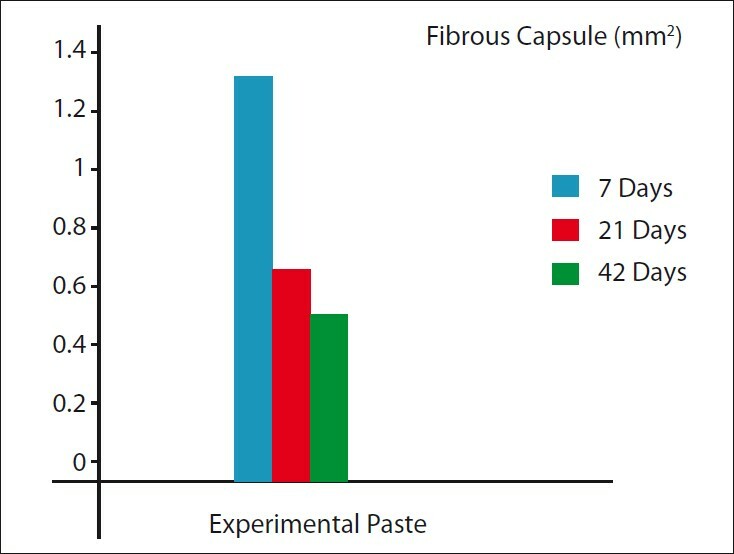 Statistical analysis (Dunn's test, P < 0.01) demonstrated significant difference between the fibrous capsule area at 7 and 42 days (P > 0.01) for experimental paste. Conclusions: Experimental endodontic paste presented satisfactory tissue reaction in the connective tissue of rats. Thus, the aim of the present study was to assess, in a preliminary manner, the tissue compatibility of the ethyl acetate fraction of P. umbellata, with the purpose of enabling its application in Endodontics in the future. This study was conducted with the approval of the Ethics Committee on Research with Animals of Federal University of Amazonas and in compliance with the ethical concepts for use of laboratory animals at all stages of the experiment. The leaves of P. umbellata used to prepare the medication were collected at the Medicinal Plant Collection of the University of Ribeirão Preto. The aerial parts of the plant were dried in an oven with forced air circulation and then macerated with ethanol/water (8:2) in an amber receptacle for 48 hours. The resulting tincture was concentrated in a rotary evaporator and then lyophilized. The fraction studied was obtained by liquid/liquid partition in a separatory funnel, adding 100 ml of distilled water and successively, the following solvents of increasing polarity scale: hexane, ethyl acetate and butanol, thus obtaining hexane, ethyl acetate, butanol and aqueous fractions, respectively, after evaporation and drying. Then, column chromatography was performed to separate the above-mentioned constituents and identify the tested chemical fraction. To obtain the polyethylene tubes (GoldLab, Ribeirão Preto, SP, Brazil), an urethra catheter with an internal diameter of 0.8 mm was used, which was sectioned at intervals of 10 mm and sealed on one of the extremities with cyanoacrylate ester-based adhesive (Super Bonder, Aachen, Germany) to prevent extravasation of the material to be tested. The medication was dispensed first by adding 0.167 mg of the ethyl acetate fraction of P. umbellata + 1 ml of propylene glycol, with the purpose of obtaining a favorable consistency, and this mixture was called "base paste". This was followed by mixing 23 μl of the "base paste" with 30 mg of calcium hydroxide P.A. (Pro Analysis) (Merck, Jacarépagua, RJ, Brazil). After obtaining the paste, the polyethylene tubes were filled with the aid of a sterile Lentulo bur (Dentsply/Maillefer, Ballaiges, Switzerland), compatible with the internal diameter of the tube, and later inserted into the dorsum of the rats. Fifteen young adult male rats (Rattus novergicus, Albinus, Holtzman) with body weight ranging from 200 to 250 g were used. The animals were anesthetized with 10% ketamine hydrochloride (Calier Laboratories S.A., Barcelona, Spain) at a concentration of 0.2 ml per 100 g body weight of the animal, administered intraperitoneally. The incisions to implant the tubes were performed on the dorsum of the animal, after trichotomy, being two incisions close to the scapular region and two close to the pelvic region. A scalpel blade n° 15 was used to make the incision that measured approximately 5 mm, compatible with the width of the tube. The tubes were inserted and the edges of the wounds were sutured. Once the implants were performed, while the animals were still anesthetized, they all received 0.2 ml intramuscular dose of veterinary pentabiotic (Wyeth Laboratory, New York, NY, USA). After 7, 21, and 42 days, the rats were euthanized by anesthetic overdose. After trichotomy and antisepsis, the implant areas were dissected and the tubes were removed for histological analysis. The analysis of the results was made based on the tissue response caused by the tested paste by comparing it with the lateral portion of the polyethylene tube (control group). By means of the histopathological analysis, the following events were assessed: inflammatory infiltrate (polymorphonuclear cells and mononuclear cells), cellularity, vascularization, macrophage activity (mononuclear phagocytes or macrophages and giant inflammatory cells) and the fibrous capsule area. Histopathological analysis was performed under a light microscope (Nikon, Tokyo, Japan) at 120× magnification, based on the tissue responses stimulated by the tested materials and the control group. Morphological analysis was performed by assessing and quantifying the above-mentioned events within these areas situated in the fibrous capsule. The total area of the fibrous capsule was measured using the Image Tool software [The University of Texas Health Science Center in San Antonio (UTHSCSA), San Antonio, TX, USA] and the values were submitted to statistical analysis (Dunn's multiple comparison test, P < 0.01). In the period of 7 days, the fibrous capsule presented an area of 1.367 mm2 . The histopathological analysis showed high population of fibroblasts and vascularization with minimal collagenization. Minimal necrotic residues at the interface of the space previously occupied by the polyethylene tube were observed. The inflammatory infiltrate was intense, with predominance of mononuclear cells. Moderate macrophage activity was observed, mainly carried out by mononuclear phagocytes and giant inflammatory cells on the dispersed material residues, both inside the capsular cone and at the surface interface with the polyethylene tube and sporadically, in the adjacencies. The general rate of inflammation was intense. The lateral side of the polyethylene tube showed no fibrous capsule formation, presenting high populations of fibroblasts and vascularization with minimal collagenization, as well as minimal necrotic residues at the interface of the space previously occupied by the polyethylene tube. The inflammatory infiltrate was moderate, with predominance of mononuclear cells with discrete macrophage activity, mainly carried out by mononuclear phagocytes and giant inflammatory cells with general rate of inflammation considered moderate [Figure 1]a and b. In the period of 21 days, the fibrous capsule presented an area of 0.720 mm2 . The analysis showed moderate populations of fibroblasts and vascularization with minimal collagenization. 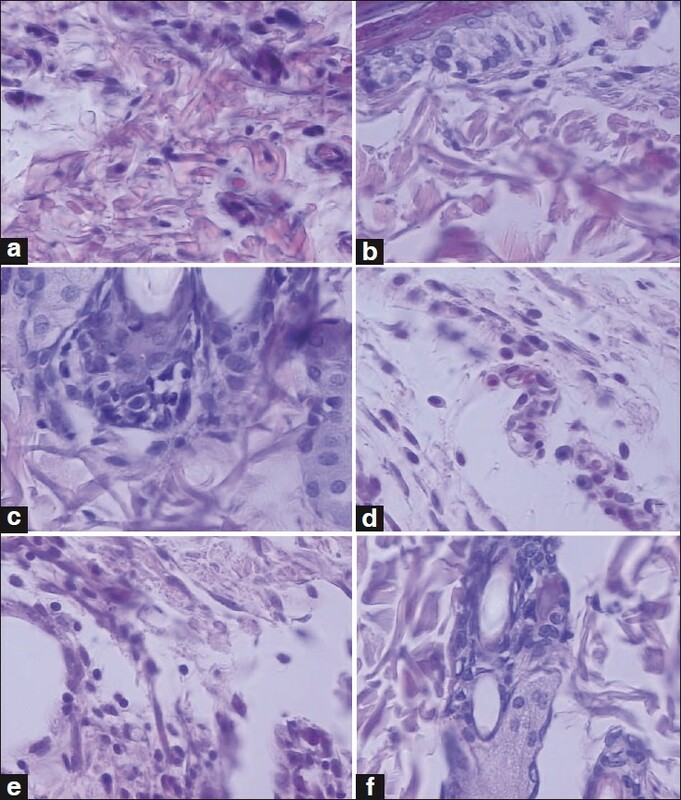 The inflammatory infiltrate was moderate with predominance of mononuclear cells and moderate macrophage activity, mainly carried out by mononuclear phagocytes and giant inflammatory cells on the dispersed material residues, both at the surface of the interface conjunctive tissue/polyethylene tube. The general rate of inflammation was moderate. The lateral side of the tube showed no fibrous capsule formation; mild inflammatory infiltrate with discrete populations of fibroblasts and vascularization with discrete collagenization were observed. Macrophage activity mainly carried out by mononuclear phagocytes and giant inflammatory cells was also observed. The general rate of inflammation was discrete [Figure 1]c and d.
Within 42 days, the fibrous capsule presented an area of 0.569 mm2 , with discrete populations of fibroblasts and vascularization, showing minimal necrotic residues at the interface of the space previously occupied by the polyethylene tube. Inflammatory infiltrate considered discrete with predominance of mononuclear cells and discrete macrophage activity mainly carried out by mononuclear phagocytes and giant inflammatory cells was also observed. The general rate of inflammation was discrete. The lateral side of the tube showed no fibrous capsule formation, discrete population of fibroblasts and vascularization with discrete collagenization. Inflammatory infiltrate was discrete with predominance of mononuclear cells and discrete macrophage activity. The general rate of inflammation was discrete [Figure 1]e and f.
The mean values for the fibrous capsule area (mm 2 ) at each experimental period are shown in [Table 1]. The lateral side of the polyethylene tube was not considered because it did not present a significant fibrous capsule area. Dunn's multiple comparison test showed statistically significant difference (P < 0.01) between the fibrous capsule area at 7 and 42 days [Table 2]. [Figure 2] shows the involution of the fibrous capsule area at the different experimental periods. The ethyl acetate fraction of P. umbellata associated with propylene glycol and calcium hydroxide showed to be an irritant material to the subcutaneous conjunctive tissue of rats at the initial period of analysis, but it did not maintain a foreign body reaction, thus allowing progressive collagenization of the fibrous capsule near to the tubular opening during the course of the experimental period. 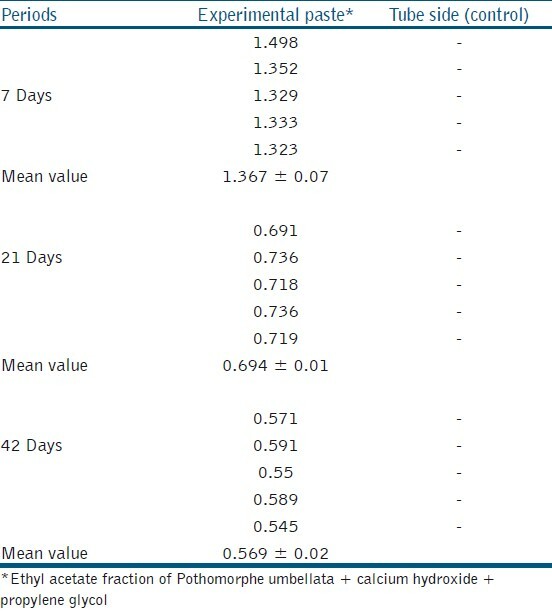 , Considering the sum of the histopathological events assessed by a comparative morphological analysis, the association of the extract of P. umbellata with propylene glycol and calcium hydroxide showed an acceptable irritant potential during the tested periods, proving its biological compatibility. It is important to point out that the results obtained in this study should not be extrapolated for clinical use in humans, since it is a level 2 test research, called secondary test, conducted in the subcutaneous tissue of rats, being an aid to evaluate the irritant potential of materials. Before the ethyl acetate fraction of P. umbellata is used in dental practice, further studies regarding its properties must be conducted. 1. Veiga VF, Zunino L, Calixto JB, Patitucci ML, Pinto AC. Phytochemical and antioedematogenic studies of commercial copaiba oils available in Brazil. Phytother Res 2001;15:476-80. 2. Garrido AD, Lia RC, França SC, Silva DJ, Astolfi-Filho S, Sousa-Neto MD. Laboratory evaluation of the physicochemical properties of a new root canal sealer based on Copaifera multijuga oil-resin. Int Endod J 2010;43:283-91. 3. Rosa PC, Mancini MN, Camargo SE, Garrido AD, Camargo CH, Rode SM. Dimensional alterations and solubility of new endodontic sealers. Braz Dent J 2010;21:301-4. 4. Pereira JV, Bergamo DC, Pereira JO, França SC, Pietro RC, Silva-Sousa YT. Antimicrobial activity of Arctium lappa constituents against microorganisms commonly found in endodontic infections. Braz Dent J 2005;16:192-6. 5. Perazzo FF, Souza GH, Lopes W, Cardoso LG, Carvalho JC, Nanayakkara NP, et al. Anti-inflammatory and analgesic properties of water-ethanolic extract from Pothomorphe umbellata (Piperaceae) aerial parts. J Ethnopharmacol 2005;99:215-20. 6. Sacoman JL, Monteiro KM, Possenti A, Figueira GM, Foglio MA, Carvalho JE. Cytotoxicity and antitumoral activity of dichloromethane extract and its fractions from Pothomorphe umbellata. Braz J Med Biol Res 2008;41:411-5. 7. Noriega P, Ropke CD, Consiglieri VO, Taqueda ME, Tavares LC, Wasicky A, et al. Optimization of Pothomorphe umbellata (L.) Miquel topical formulations using experimental design. Int J Pharm 2008;353:149-59. 8. Isobe T, Ohsaki A, Nagata K. Antibacterial constituents against Helicobacter pylori of Brazilian medicinal plant, Pariparoba. Yakugaku Zasshi 2002;122:291-4. 9. Estrela C, Estrela CR, Pécora JD. A study of the time necessary for calcium hydroxide to eliminate microorganisms in infected canals. J Appl Oral Sci 2003;11:133-7. 10. Gomes BP, Pinheiro ET, Souza EL, Jacinto RC, Zaia AA, Ferraz CC, et al. Enterococcus faecalis in dental root canals detected by culture and by polymerase chain reaction analysis. Oral Surg Oral Med Oral Pathol Oral Radiol Endod 2006;102:247-53. 11. Siqueira JF, Rocas IN, Riche FN, Provenzano JC. Clinical outcome of the endodontic treatment of teeth with apical periodontitis using an antimicrobial protocol. Oral Surg Oral Med Oral Pathol Oral Radiol Endod 2008;106:757-62. 12. Campos-Pinto MM, Oliveira DA, Versiani MA, Silva-Sousa YT, Sousa-Neto DM, Cruz DP. Assessment of the biocompatibility of Epiphany root canal sealer in rat subcutaneous tissues. Oral Surg Oral Med Oral Pathol Oral Radiol Endod 2008;105:77-81. 13. Nassri MR, Lia RC, Bombana AC. Analysis of the tissue answer regarding of two root canal sealers. J Appl Oral Sci 2003;11:9-14. 14. Estrela C, Pimenta FC, Ito IY, Bammann LL. Antimicrobial evaluation of calcium hydroxide in infected dentinal tubules. J Endod 1999;25:416-8. 15. Fava LR, Saunders WP. Calcium hydroxide paste: Classification and clinical indications. Int Endod J 1999;32:257-82. 16. Evans MD, Baumgartner JC, Khemaleelakul S, Xia T. Efficacy of calcium hydroxide: Chlorhexidine paste as an intracanal medication in bovine dentin. J Endod 2003;29:238-9. 17. Shahi S, Rahimi S, Lotfi M, Yavari HR, Gaderian AR. A comparative study of the biocompatibility of three root-end filling materials in rat connective tissue. J Endod 2006;32:776-80. 18. Mongelli E, Coussio J, Ciccia G. Investigation of the larvacidal activity of Pothomorphe peltata and isolation of the active constituent. Phytot Res 2002;16:71-2. 19. Barros S, Ropke CD, Sawada TC, Silva VV, Pereira SM, Barros SB. Assesment of acute and subchronic oral toxicity of ethabolic extract of Photomorphe umbellata. Braz J Pharmacol Sci 2005;41:53-61. 20. Ropke CD, Kaneko TM, Rodrigues RM, Silva VV, Barros S, Sawada TC, et al. Evaluation of percutaneous absorption of 4-nerolidylcathecol from four topical formulations. Int J Pharm 2005;5:109-16. 21. Ropke CD, Silva VV, Kera CZ, Miranda DV, Almeida RL, Sawada TC, et al. In vitro and in vivo inhibition of skin matrix metalloproteinases by Pothomorphe umbellata root extract. Photoch Photobiol 2006;82:39-42.
de oliveira marreiro, r. and bandeira, m.f.c.l. and de souza, t.p. and de almeida, m.c. and bendaham, k. and naura venâncio, g. and costa rodrigues, i. and coelho, c.n. and milério, p.s.l.l. and de oliveira, g.p. and de oliveira conde, n.c.